Toss out the pre-faded "dad jeans" and up your style with this men's denim primer and deal guide. The cornerstone of men's clothing is timeless, classic style. The phrase "timeless men's style" immediately brings to mind things like well-cut suits, leather jackets, aviator sunglasses, and dive watches -- articles of clothing that men have been wearing for decades (even centuries) and will be wearing for decades to come. One of the most ubiquitous classic items in a man's wardrobe is his trusty pair of blue jeans. Denim dates back centuries, was made popular in America in the 1800's, and has remained a staple of men's clothing ever since. Over the years, blue jeans have gone through many different iterations, including a number of unfortunate style missteps. Furthermore, the quality of denim manufacturing has declined throughout the 20th century, as many clothing companies move toward quantity over quality. Fortunately, this trend has reversed in recent years, with more and more men favoring quality jeans made using traditional methods. This guide will focus on classic blue jean style, as well as features to look for in a well-made pair. Denim dates back to at least the 18th century, with the thick canvas-like weave possibly dating even further back. Although some of the details of denim's long history are not fully known, what's important to know is that the textile itself is very old. It was favored for its rugged and versatile nature, and was very popular with European sailors, as well as American cowboys in the Old West, as a durable fabric for their trousers. Denim remains one of the most popular clothing fabrics to this day, and blue jeans are ubiquitous. As a textile, denim is a type of twill. What makes denim unique is its weave: the horizontal threads (the "weft") pass underneath two or more vertical threads (the "warp"). This is what gives denim its visual texture. Denim, particularly in dark jeans, is often colored by dying only the warp threads and leaving the weft threads un-dyed. This is why the color on many dark jeans appears to be flecked with white, rather than being a single flat color, and the reason that such denim is white on the reverse side. Selvedge (sometimes spelled "selvage") is the traditional construction method used in jeans,wherein the edge of the fabric is finished in such a manner that it will not fray or unravel. It fell out of favor in the mid-20th century as manufacturing became increasingly outsourced and cheaper. Selvedge has nonetheless become popular again in recent years due to its quality and durability. 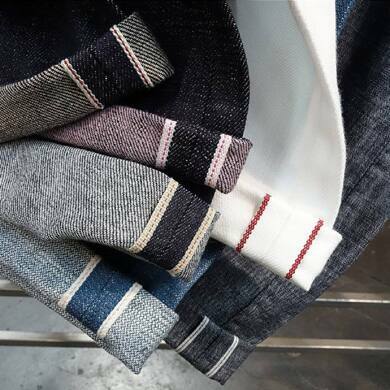 Selvedge denim is a more time-consuming process, requiring extra fabric and special machinery, so selvedge denim is generally more expensive. Given the extra craftsmanship involved with selvedge, this denim is typically seen on higher-end jeans. Many denim enthusiasts will also wear their selvedge jeans cuffed at the bottom to show off the finished edges. Cuffing also reduces "crocking," where the dye from the jeans (particularly that of unwashed raw denim) rubs off on one's shoes. Although selvedge is a desirable quality, it isn't necessary for a good pair of jeans. Many well-made jeans are made of selvedge, others are not -- the lack of selvedge itself does not mean that you should avoid buying a pair of jeans that you like. However, bear in mind that if a pair is crafted with selvedge denim, it is probably going to be well-made, so for traditionally made quality denim, selvedge is the way to go. A final note about the fabric: denim thickness is called "weight," referring to the weight of a yard of that particular cloth. The higher the weight, the thicker the fabric. The weight you choose for your denim is really up to you. 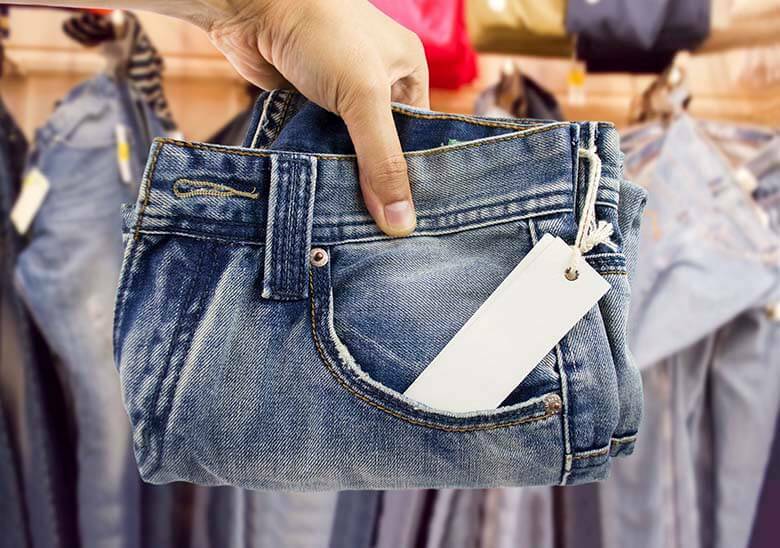 Thinner jeans will be lighter, cooler, and require less break-in, but will be less durable. Thicker denim will be more rugged and warmer, but thick raw denim may feel very stiff and uncomfortable for awhile before it is broken in. 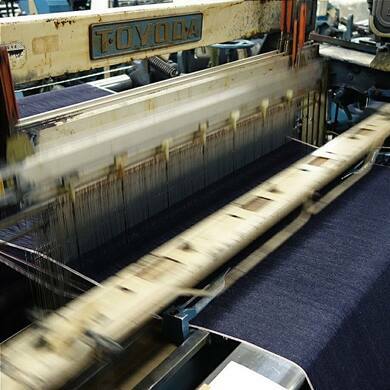 Along with selvedge, denim that remains unwashed after the dyeing process has also grown popular in recent years. This is called "raw" or "dry" denim, and is highly favored by denim enthusiasts due to its unique feel and fading characteristics. Like good leather, raw denim will mold itself to the owner over time, and the undyed fabric will create unique fading patterns with wear. Whether or not you want raw denim is largely a personal choice. While valued by many for its unique characteristics, others may not want raw denim precisely because it fades. For a dark-colored pair of smart casual jeans, such as those a man might wear to work with a sport coat and/or a dress shirt, the fades that raw denim will eventually show are probably not desirable. Another consideration regarding raw denim is the amount of care involved, which is why this type of wash has so far remained squarely in the "enthusiast" crowd. Although raw denim fading looks natural, a certain amount of effort is required to ensure that the jeans fade properly and the fabric doesn't lose its color where it shouldn't. One should also bear in mind that, as mentioned earlier, raw denim has tendency to rub its color off on lighter fabrics. Care for raw denim can include not washing the jeans (or washing them very sparingly) during the initial break-in period, as this can rinse out the dye and ruin the fading process. As Slickdealer _simmer points out, some guys will even put their raw jeans in the freezer to kill any odors and bacteria without having to wash them. You really don't need to go that far, however. In fact, some argue that not washing your jeans a few times during the break-in period can lead to seam blowouts. Your grandpa and his buddies probably didn't fuss too much about "fades" and not washing their jeans. Just soak them in tepid water with a bit of soap and hang them up to air-dry to avoid dye loss. This is what everybody used to do before washing machines were invented, anyway. Due to the fact that the fabric is unwashed, raw denim can feel rough and stiff against the skin, and will not be as comfortable as a typical pair of jeans right out of the box. Raw denim requires a "break-in" period, where it will soften with wear and time like a leather jacket. Denim enthusiasts often enjoy this break-in period, as the fabric will fade and mold itself to the wearer, but some people may prefer the softer feel of pre-washed jeans. 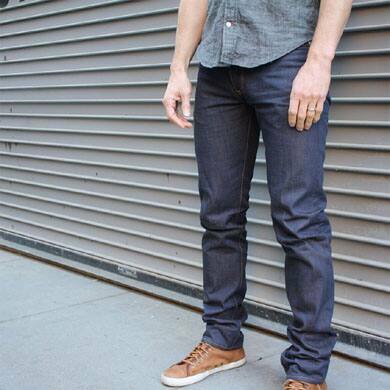 Raw or washed, selvedge or not, the go-to color for a basic pair of men's jeans is indigo. Indigo was historically the original dye used for almost all denim, (which is why we call them "blue jeans") and remains the most versatile option. A dark pair of indigo jeans can be dressed down with a tee shirt and sneakers or can be dressed up with a blazer and pair of dress shoes for a date or a day at the office. After a man has a good pair or three of dark indigo jeans, it's fine for him to explore some other solid colors. British tan or khaki-colored jeans can look very sharp, like a pair of chinos but with the ruggedness and visual texture of denim. A good rule here is that pretty much any color that is acceptable for trousers is fine for denim. Some people have mixed opinions on white jeans, but if you like it, white denim can create a very sharp and clean look in the warmer months, while also reflecting the sun's heat in climates where you might not otherwise feel like wearing jeans. Black, while less versatile than indigo, is another good option for dark denim. When it comes to fit, jeans can be a bit trickier than other pants like chinos. Denim stretches more than other fabrics, and this will be even more noticeable with raw denim, which has not been pre-shrunk (meaning you may need to adjust the size you buy, as Slickdealer Spaced_Inv8r points out). However, raw denim is prized partly because of this, as it will stretch a bit with wear and mold itself to your body as it breaks in, so don't worry if a pair of raw jeans feels a bit snug at first. Also, premium denim makers will likely not feature vanity sizing like many off-the-rack American brands, so be sure to use a tape measure and find your true waist measurement. Another note about fit: some premium jeans, particularly raw and selvedge, will come with a longer inseam than your typical pair of pants. This is so that you can cuff your jeans to show the selvedge and prevent crocking, although many denim enthusiasts prefer instead to "stack" the denim by letting it sit on the shoe normally. The extra leg material will scrunch up around the ankle, creating unique fading patterns with raw denim. Just keep in mind that if you prefer your jeans to have your usual inseam length, you will want to double-check the specifications of the pair you plan to buy when shopping online. As far as style goes, the general rule with denim (as with trousers) is to keep it slim. Your jeans should follow your leg without being too tight and restricting, and without being too baggy with excess material billowing in the breeze. Trendy fits like skinny jeans are just that - trends - and will probably be remembered like bell-bottoms and pre-torn jeans are remembered now. Stick to the classic slimmer cuts: not too baggy, not too skinny. Lately, some style blogs and magazines have argued that pre-faded stone-washed jeans - referred to by one Slickdealer as "dad jeans" - are back in style. This guide recommends you proceed with caution here. If something went out of fashion once, it will likely go out of fashion again. With classic menswear like blue jeans, it's almost always better to stick to the tried-and-true styles, and not concern oneself with temporary fads and trends that fade faster than raw denim. Almost every men's clothing brand sells jeans. However, we will list some brands that either make jeans almost exclusively or offer higher-end denim, such as raw and selvedge. The usual caveat applies here: this is just a mere handful of the many denim brands currently operating, and it behooves the style-conscious man to do some research and find the quality makers out there that best suit his personal tastes. Many of the best denim brands today are small, privately-run operations that are relatively new due to the recent shift towards traditional styles and domestic manufacturing. Levi's - Levi Strauss is arguably the most iconic and historic denim brand around. Although most of their clothing is manufactured overseas today, many denim enthusiasts, who are willing to spend hundreds on a single high-end pair, still favor Levi's 501 shrink-to-fit jeans, which can be had for around $50. Naked & Famous - Naked & Famous will certainly be a step up from the sort of cheap off-the-rack jeans most men are used to buying. They offer quality raw and selvedge denim, and their prices are very competitive with other high-end brands. They also carry a variety of different fits suited for various body types rather than the simple "regular/slim/skinny" options usually on offer. Uniqlo - A Japanese company, Uniqlo is a clothing retailer offering low-cost garments similar to brands like H&M. However, they also offer some excellent denim from Japan, which currently produces the most selvedge denim of any country. (Most of the remaining old shuttle looms are in Japan, and selvedge never really went out of favor there.) We've seen deals on some of their selvedge where costs were about as low as a pair of Levi's. Gustin - Gustin's business model of "crowd-sourced clothing" is admittedly a love-it-or-hate it ordeal. However, the upstart company offers some quality American-made clothing, particularly their slim-fitting and competitively-priced selvedge denim. The denim fabric they use is sourced from Japan. 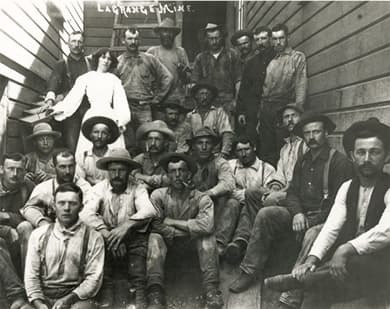 Lee Cooper - A relatively unknown maker in the United States, Lee Cooper could also be called the "British Levi's." This brand was made popular in the years surrounding World War II, when the company became one of the biggest suppliers to the British military. Jacob Davis - Although not domestically-made, Jacob Davis represents a great value in selvedge denim. They get a special mention here, as their jeans are good for athletic guys with bigger thighs who may have trouble fitting into some slimmer cuts favored by a lot of modern denim brands. Brands like Uniqlo and Levi's frequently run sales on their websites, so check in regularly and sign up for email newsletters to be notified of current and upcoming deals. Many brands are also sold at retail outlets like Nordstrom, which regularly run sales of their own. Nordstrom Rack, for example, is a great place to snag some great deals on quality clothing. Although cheap, mass-produced, pre-washed denim has unfortunately dominated the latter half of the 20th century, the market is swinging back as more men demand traditionally-made jeans that are built to last. Rock those inexpensive store-bought jeans if you like them, but every man should own at least one good pair of raw selvedge denim -- wear them, break them in like a leather jacket, and you'll enjoy them for decades to come. Lucas enjoys reading and writing about men's lifestyle topics such as clothing, accessories, gear, and fitness. Like many men today, Lucas is on a quest to learn as much as he can about the art of traditional menswear and to share that information with others.